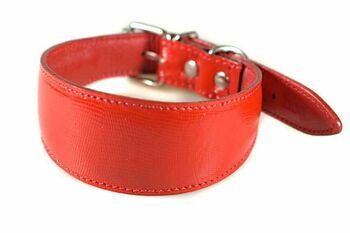 Our traditional handmade red leather hound collar model with red stitching. 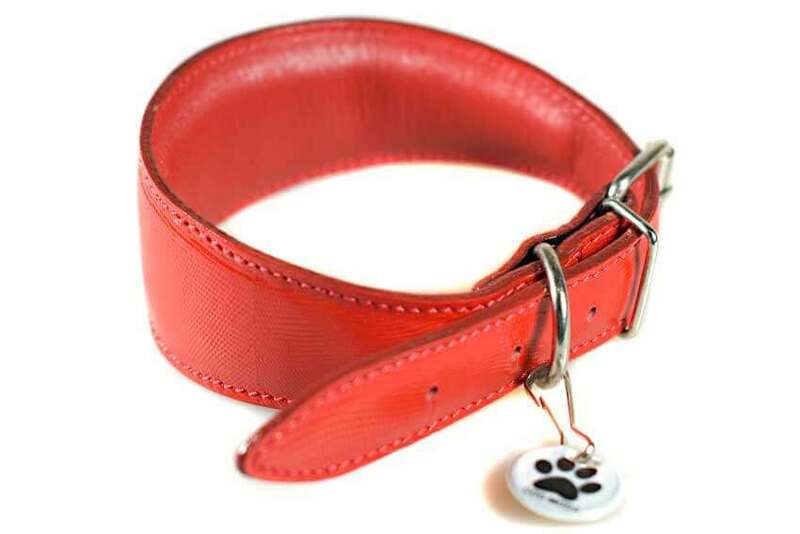 Simple and practical red leather collar is made from truly stunning red coloured genuine stamped patent leather with a high gloss shine. 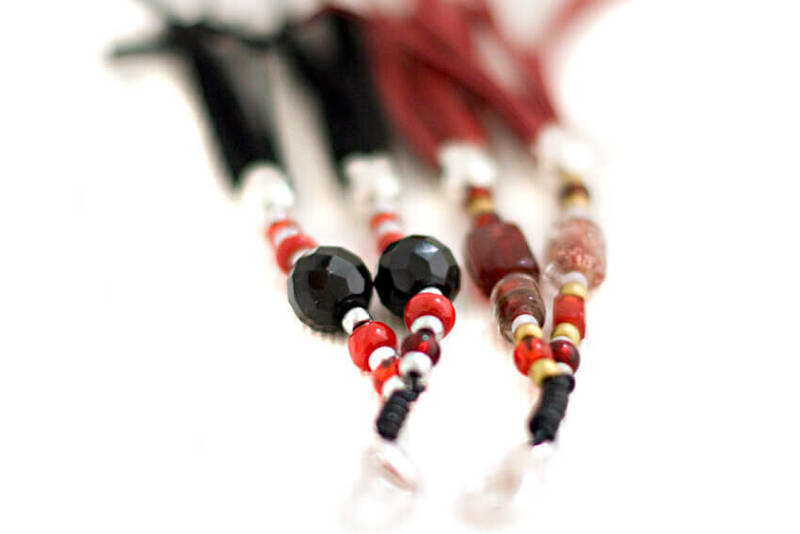 The sighthound collar is fully lined with softest deep red goat skin leather and padded for ultimate comfort. 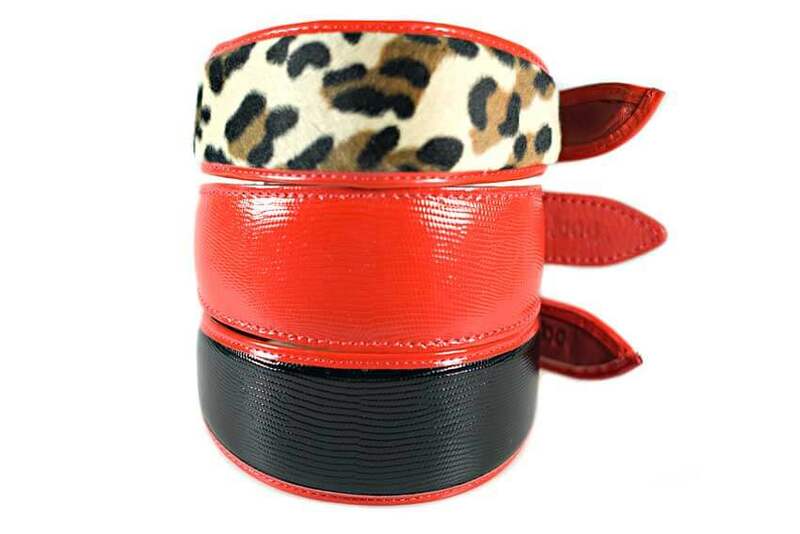 This collar is only available in size Large to fit Greyhounds, galgos, larger lurchers, Deerhounds and male Afghan hounds. Combining style, practicality and comfort this handmade leather sighthound shaped collar is strong, durable yet lightweight and extremely comfortable on long delicate necks. Handmade using strong solid D rings, high quality rivets, reinforced by double stitching, fully padded throughout and and finished with genuine red leather lining along the whole length of the collar. I have used Dog Moda collars for my lurchers. I find your lurcher collars to be of excellent quality, I like them as they are colourful and very different from the 'norm' that can be purchased for the breed. Dog Moda web site is very easy to navigate and user/customer friendly. This is the third hound collar I have purchased from you and it is lovely. The red imitation snakeskin is slightly more stiff than the previous 2 but will soften up I’m sure. I really like the fact that your hound collars are well padded and all our hounds have been comfortable wearing them. Customer service was excellent, it arrived a couple of days after placing my order. I’m attaching a photo of Callie wearing her new collar which I think really suits her. Thanks once again.